Last year I wrote a review of the multi-dock application, SuperTab, describing how it leaves Apple’s traditional Dock behind in the dust when it comes to doing more than just launching applications. Well now the 3.0 version of SuperTab was recently released, and it addresses many of the features that I and other users have been waiting to see that makes the application more useful. Note, SuperTab 4.0 has been release. See my updated review here. This article is about the 3.0 version, but it also contains useful tips for using SuperTab. This article is not an overall review of SuperTab, which I’ve already written. But the video below provides you a basic overview, and the website itself provides screenshots of all the application’s features, which are too many to cover in a single blog post. SuperTab can be triggered using hotkeys, similar to how you use keyboard shortcuts to trigger the Application Switcher on the Mac. But since my hand is on my trackpad when I need to use SuperTab, I prefer activating it by using a BetterTouchTool finger gesture (more about that in the next section), or dragging the cursor to the bottom-right hot corner of my desktop. I also have the Double-Press Command Key enabled. 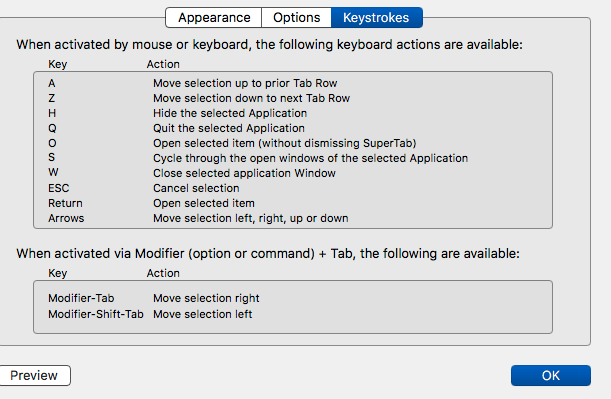 I might trigger that hotkey on occasion using a Keyboard Maestro string trigger if I’m typing and I want to quickly activate SuperTab. From the keyboard you can actually press assigned keys to navigate your SuperTab docks and open selected items. The BTT trigger reduces the need to the drag cursor to the corner of my 27″ monitor. And because of this quick accessibility, I also keep an Active Apps Row in SuperTab so I can quickly switch between applications or use the designated keys to quit, hide or open applications. 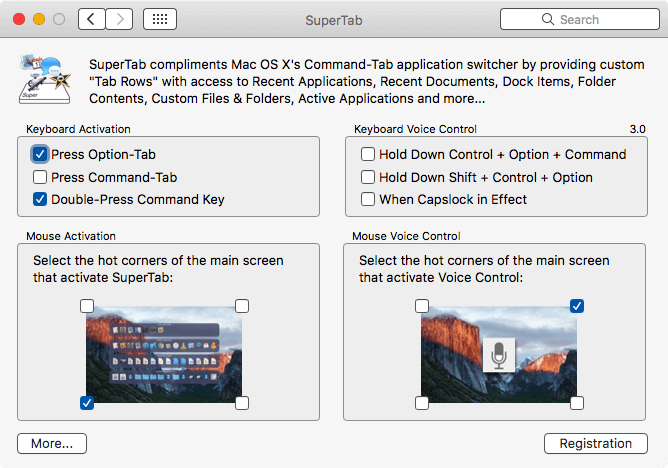 Note: I don’t use Apple’s Voice Control feature (I use Dragon Dictate voice commands instead), but notice also that you can use SuperTab to activate it from a hot screen corner. 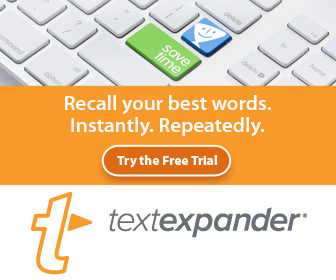 SuperTab is available for a free 30-day download. The full license is $20, but MAT readers can purchase it for 60% off (affiliate link, thank you.) That’s $8! The upgrade price is only $2.99. I especially like to use SuperTab to click and open my most visited webpages from within any application. This reduces the need to open the Favorite pages in Safari and then locate the webpage I want to download. Similarly I use SuperTab to create a new email message from within any application. Triggering a new message is based on SuperTab’s Auto Type which I will discuss in later in this article. The following video demonstrates how I trigger a webpage or a new mail message from within a SuperTab row. 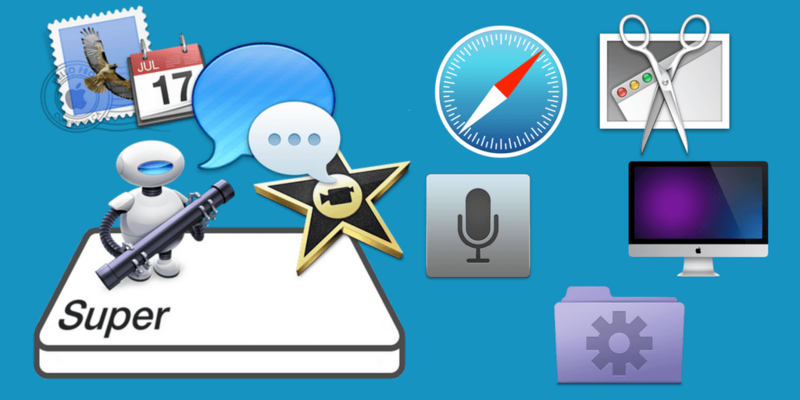 What also makes the bookmarking feature very useful is that you can simply drag a URL from a web browser onto the website Tab Row, and configure it with a custom name, or even add a hotkey to activate it. This reduces the need to copy and paste the URL in the Where Site configuration. Notice also that this Website Site action can trigger an Auto Type action, which I describe in the next section. SuperTab’s Auto Type feature is similar to Keyboard Maestro macros in that an Auto Type feature consists of selected actions that are ran when the item is triggered. 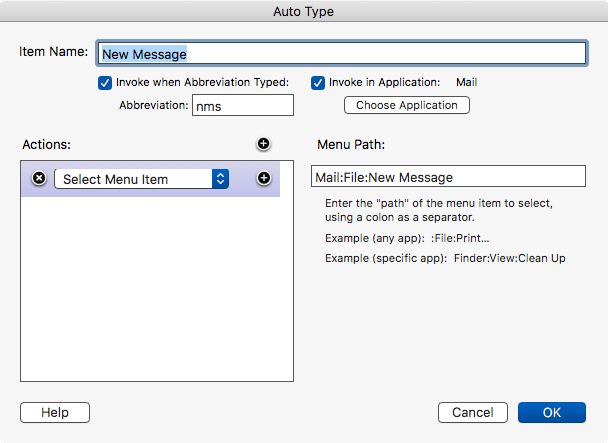 In the example below, the Auto Type triggers the menu item for a new message in Mail. I trigger the Auto Type item by clicking on the Tab Row, but you can also trigger the item with a hotkey or when an abbreviation is a typed, which is similar to string triggers in Keyboard Maestro. 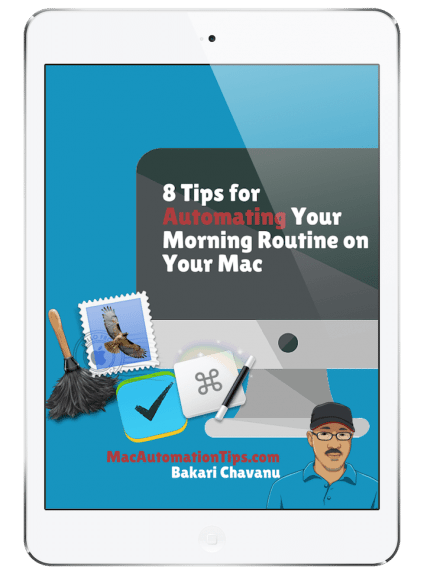 The Auto Type feature includes actions for activating menu items, inserting text, and clicking numerous keys, including the Return, Delete, and Arrow keys. You can add a series of actions to activate an Auto-Type item with a single click or hotkey. One of the features I really needed to make SuperTab more useful is the ability to label items in the Tab Rows. Before this feature was included in 3.0, I didn’t make much use of my bookmarks or the Meta Folders in SuperTab because it was a little too difficult to remember what those items were without the labels. To add or change a labor for an item, you click on the down triangle on the top-right of the item, and then select the Configure button edit the existing URL label. I have plenty of clipboard managers including iClip and Pastebot, but I added a SuperTab Tab Row in the mix, because I like to drag selected clippings from the row the saves the last ten clippings to a row which those clippings will remain there until I delete them. I use this set up for when I know I’ll need use a clipping and I don’t want to hunt for it in my other clipboard managers. SuperTap makes it easier and quicker to access. Another handy feature I use is the screenshot feature. SuperTab allows for activating full screen, front window, selected window, and manually selected screenshots without having to use a hotkey. 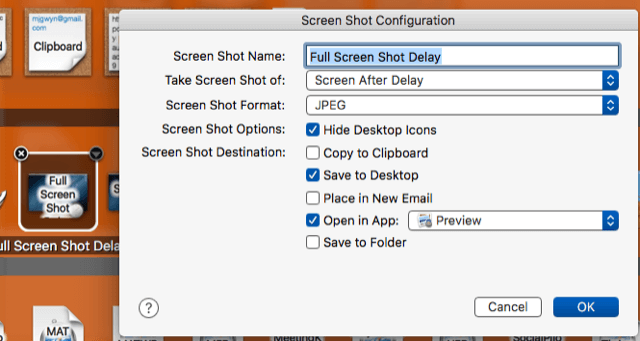 I configured a Screen After Delay item, because it not only takes the full screen shot after a five second delay, but it also automatically opens that delay in Preview, and application I selected for editing screenshots. As I said before, SuperTab contains dozens of features including custom rows for your Dropbox content, Snagit screenshot captures, Tagged Items, Application Windows, Recent Applications, and Finder folders. You can adjust the size of the Tab Rows and icons, to fit within your desktop screen. With so many great features, I recommend that you take your time and see what you need most in your SuperTab setup. With the 3.0 update, I made some changes to my rows, and because of the ability to label folders, I moved many of my lesser used applications into Meta Folders instead of having them parked into rows taking up space. 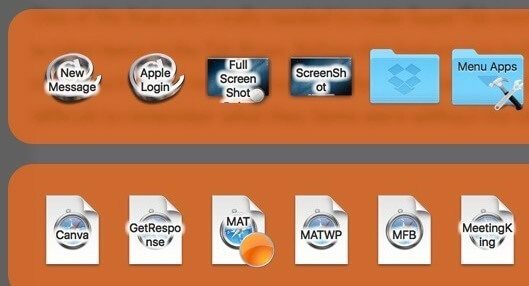 My Daily Tools row is a sort a secondary Dock for applications that I don’t need in my Apple Dock, but I want to quickly launch those applications without having to open the Applications folder or using Alfred launch when my hand is already on my trackpad. If you haven’t already done so, you owe it to yourself to give SuperTab a try. It’s not an obtrusive application because stays it in the background until you need it. But is packed with features that over time you can learn to use for your particular needs. 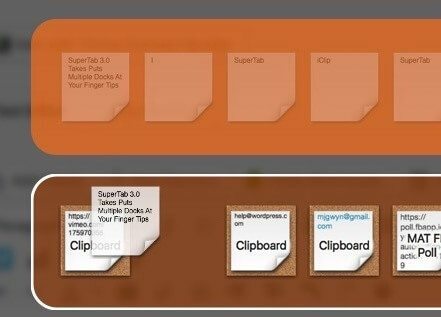 Let me know what you think of SuperTab and how you use it in your workflow. It took me only a few hours of playing with SuperTab to decide that it’s well worth the cost. SuperTab makes many things easier, and doesn’t interfere with the normal way of doing things. Thanks, Javier, for your feedback. And you’re absolutely correct. SuperTab stays out of the way until you need it. Thanks very much for this. Had me at the quick access to screenshots. Hey, thanks Tony. Yeah, the screenshot feature is very useful. 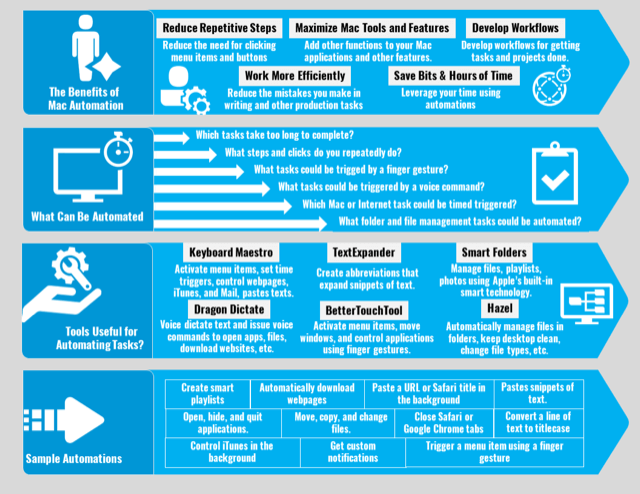 Much better than hitting keyboard shortcuts. Awesome, thanks for the feedback. I would like to add comment to my testimonials. Please keep in touch. This app looks great I am going to install it on my pc.